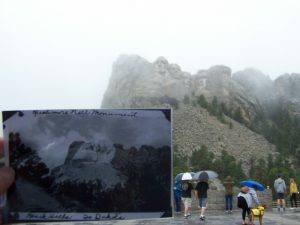 Sunday June 17 – Visiting Mount Rushmore and some of our nation’s founding fathers on Father’s Day seemed appropriate. 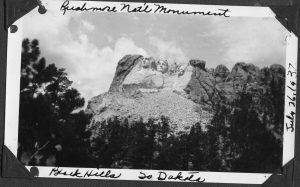 When Earl and Ethel visited Rushmore in July ’37 only George Washington and Thomas Jefferson were complete. Washington was dedicated July 4, 1934 and Jefferson in 1936. Abraham Lincoln was still a work in progress when they were there. 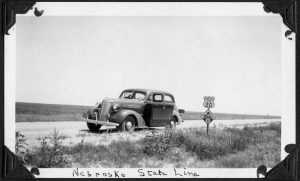 His sculpture would be dedicated in September 1937. 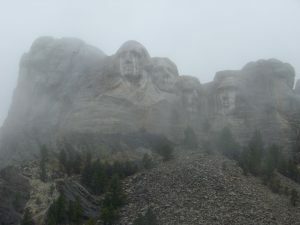 The rain on the 60-foot tall carvings that morning gave the appearance that Washington, Lincoln, and Roosevelt were weeping and Thomas Jefferson had a bloody nose. That observation was heard from many as they entered the viewing area. Perhaps it was just a regular weather-related phenomenon with no deeper meaning to be attributed to it. Still, the affect was haunting and gave many, including us, pause. 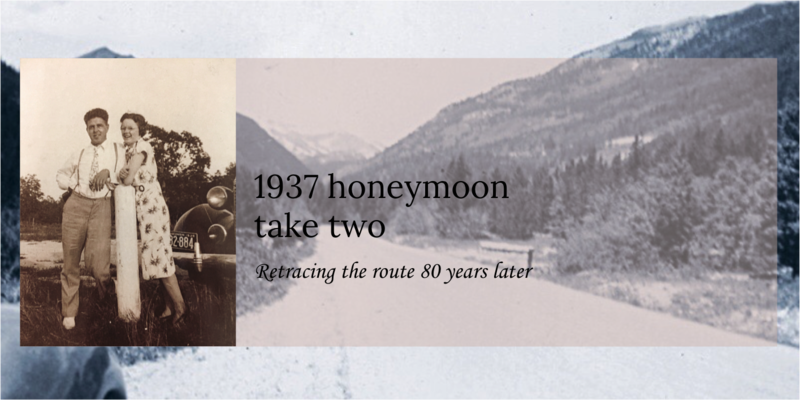 We found another poster and post card in the historic National Park scenic highways series appropriate to our trip. 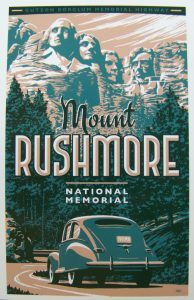 The creator, John Clark has a website at scenichwys.com with similar images but it appears his national park work can only be purchased at the NP gift-shops. If you like the series be sure to make a purchase. It’s Earl and Ethel approved!